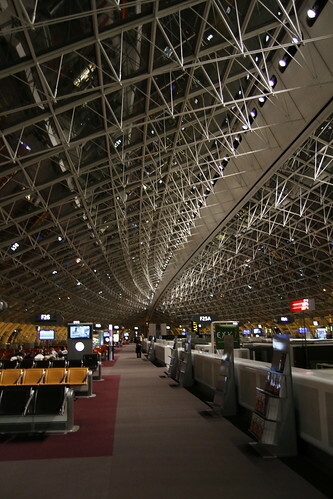 I arrived at the Charles De Gaulle Airport on 4am. I was supposed to wait for 3 hours before the transit to Nice. As I was in the airport, I cannot help but remember the trip to Venice last September when we stopped by also at the Charles De Gaulle airport in Paris before our transit to Venice (check out the post, I even took a similar photo from the same spot, but with a different camera). I was then with Maiko the Producer and Linto the Postproduction supervisor (we were heading off to the Venice Film Festival for the screening of my short film KINGYO). 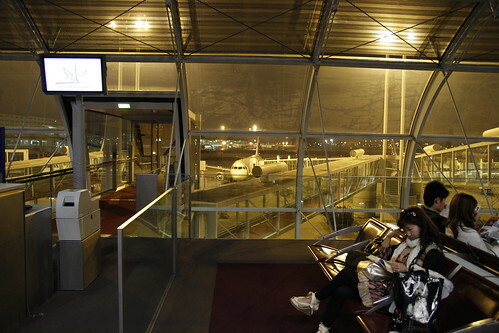 In fact, I think I was also in the airport at the exact same time. 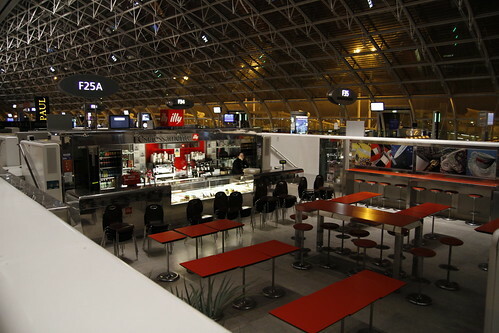 I remember they were setting up the cafe and that was where we had breakfast. So, 8 months ago, it was for the Venice Film Fest. Now, it was for the Cannes Film Fest. How fitting it is, to have this seemingly parallel occurrence. I was alone, and I didn't feel like eating, so I took a nap instead. I woke up shortly before we boarded the train to Nice. Flight from Paris to Nice was an hour and a half (I slept through the flight). Reached Nice at 9pm. Took a bus to Juan Le Pins (ride lasted for 40 minutes). Found my hotel, checked in, and headed to Cannes. 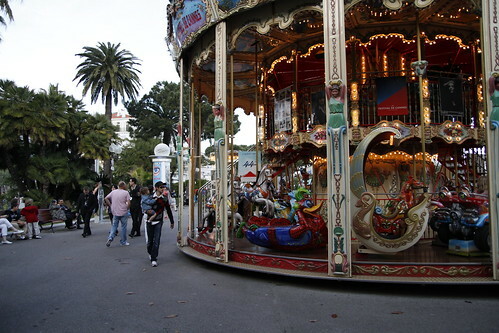 This is the Main Palais. Lots of people at the beach nearby. I went into the Cannes Market, lined up for food. There were two Hong Kong women speaking behind me, one skinny, one stout. "Heya, what do you do?" I asked with genuine curiosity. Most of the people in Hong Kong I met in film festivals had often been friendly, and excited when they hear someone speaking else speaking to them in Cantonese. I still remember the happy memories of hanging out with those TVB folks back in Venice, and Pusan. "Things." The stout one answered. I was a little mortified by the hostility. I later met up with some people, film festival programmers of other film fests. Followed them to a market screening of a Japanese film. Walked out after the one-hour mark (we figured the rest of the 90 minutes ain't worth sitting through). However, the party was about to end, so I was only there for a while before I left. It was strange, the sky only started darkening at around 9 at night. Dabido asked me to say hello to Angelina (Jolie) for him. 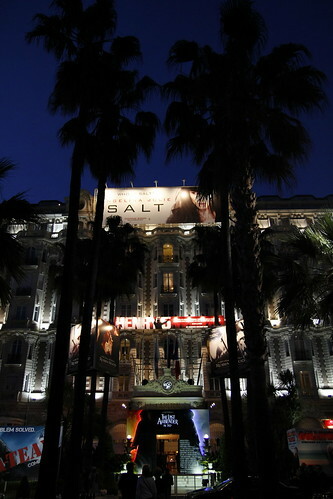 I saw a poster of her new film, SALT, on a building, so I took a photo. 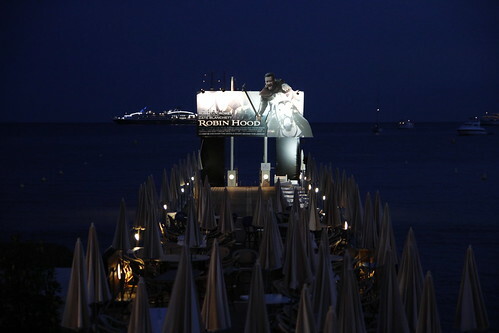 Robin Hood was the opening film of Cannes Film Festival. I doubt I'll bump into Russell Crowe though. 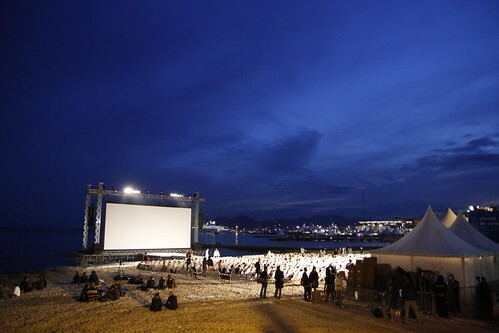 As I headed back to the train station, and walked past what seemed like a venue for an outdoor screening. I thought of the film Cinema Paradiso.